They are doing better than before it must be said. However there are some serious underlying problems they are not addressing or even ignoring. Debt fuelled investment is one....human capital training is another. Another major one is their own private banking....they just do not have equivalents of HDFC etc which means GCF and underlying capacity addition is very sensitive and vulnerable to all kinds of shocks when they come. The discourse is also very "uni-centric"...i.e if only one particular thing is fixed, that this will be the panacea to all the problems. This has been crystallised by the CPEC issue I find now....something else will replace it when CPEC is found to not be the cure-all....and the cycle will continue unless there is an attitude change. It may be a deeper psychology at work, stemming ultimately by being taught and conditioned to form their identity in opposition to the "one" solitary monolith that is India. Hence why their military dominates their society and why any discussion ultimately re-routes to India. Very few of them are capable of addressing complex multi-centric discussion and I don't expect this to change any time soon. Its spillover into their policy making is very telling as well. I wish Pakistan and all pakistanis all the success with CPEC. If it brings optimism to them, then great. One aspect which surprises me is the pride that most of the cheerleaders take in transforming their nation into a transit state. anant_s, randomradio, Inactive and 2 others like this. I made some back of the hand calculations and found that it is 16 times costlier ,and consume twice the time, to transport anything to China by CPEC ,compared to transport by Sea. 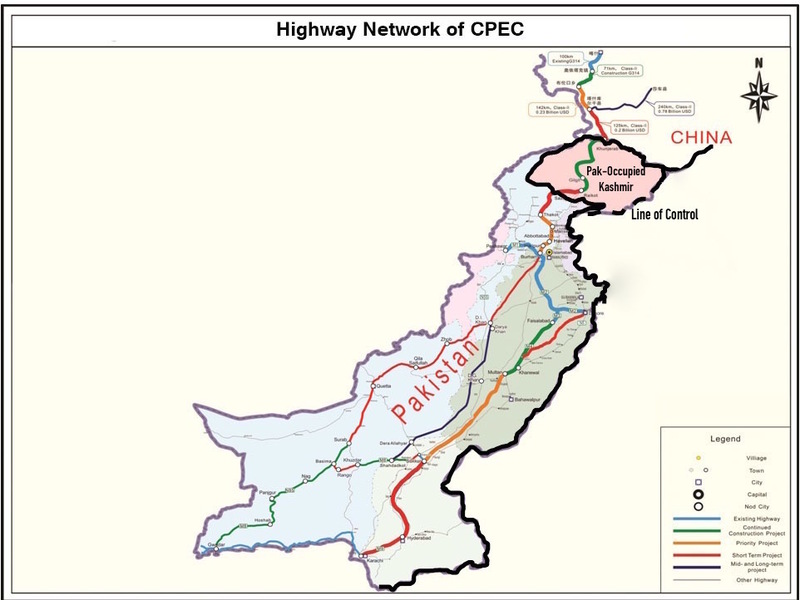 On top of it CPEC passes through Khunjreb pass which is open only for six monts, and CPEC opens up in Takla makan desert which is half of the size of Pakistan, and Chinese province of XinXiang which it pretend to be serving is 2 times that of Pakistan and population of just 12% that of Pakistan. There is no population base for CPEC to serve. What China here has done is built a strategic alternative for itself ,in case Strait of Malacca got blocked, AND made Pakistan pay for it. This project would fall far below its expectation, and when it does, some civilian would be take a fall for it. Just wait till debt taken for CPEC come to haunt Pakistanis. It would be Nandipur Power plant times hundred. Sathya, Agent_47, R!CK and 2 others like this. Major share of CPEC benefits will be reaped by Pakistan and while there will be benefits to Pakistani economy, doubts still persist if this is going to benefit the nation as a whole. Classical theory of economics tell us that such large infra projects bring benefit to people alongside, but here the issue is how (and if) Pakistan will be able to leverage this massive project to its advantage. China essentially now has one short route connecting in interior North west to All weather sea port and hence this investment is actually going to help extend its control over far North west provinces and off course allow industries to flourish. But in Pakistan, in order to take advantage, massive investment in required in local industry and skill development and i'm not sure if government has enough money and political will for same. Actually, what is the state of the economy. I see them growing 4%-5%. How good is it wrt them? How bad is debt ? 94% of Sri Lankan national revenues is going into debt servicing. Only 6% is for education, health etc. And they have taken large amounts of foreign loan. All the Chinese led projects have failed. R!CK and Nilgiri like this. Gwadar has less than 100,000 people and will have an international airport. And the electricity from Chinese plants are three times that of India's. The Pakistanis are rich people. We should be happy for them. R!CK and A_poster like this. The electricity generating projects are likely to saddle the Pakistani government with a massive fiscal burden but the real cost of CPEC is likely to be felt in the changing civil-military balance. It has been a year since the China Pakistan Economic Corridor (CPEC) was launched on a wave of Pakistani euphoria. It was called a game-changer, so Pakistan has played the new game for a year now, and though the rest of the world – and Pakistanis outside government – have no clue what the rules are, it is becoming clear that if ever there was what cricketers call a corridor of uncertainty, this is one. Nawaz Sharif, a batsman in his prime, knows that the best you can hope for in that corridor is the fortuitous reward of a Chinese cut. Though there are fears in Lutyens’ Delhi that the corridor will be a strategic nightmare for India, there is a greater chance of it becoming an incubus for Pakistan. $34.4 billion of the $46 billion announced are for power projects, of which the government designated 16 as early-harvest, the yield presumably its re-election in 2018. These will add 10,400 MW of generating capacity to the grid, which the government claimed would resolve Pakistan’s critical shortage of power, now as much a political as an economic problem. This is misleading, for several reasons. Firstly, Pakistan’s power crisis does not flow from a shortage of generating capacity. Installed capacity is 22,800 MW, more than enough for the current demand of 19000 MW. Many thermal plants were idle because of a shortage of feedstock, but in February this year, Pakistan signed an agreement with Qatar, at unit costs 20% less than it paid in 2013, to import 3.75 million tonnes of LNG each year for them, and for the six plants being built in Punjab, which will add 3600 MW to installed capacity. Secondly, work is also reported to be under way on several hydropower projects, all with international partners, some of them Chinese, which dwarf those of CPEC in scope. Just seven of them – Diamer-Bhasha and Bonji in Gilgit-Baltistan in Pakistan-occupied Kashmir, Neelam-Jhelum, Azad Pattan and Mehl in the ‘Azad Jammu Kashmir’ part of POK, and Tarbela IV and V and Dasu in Khyber-Pakhtunkhwa – will add another 21,129 MW to the grid. That is more than double the early-harvest projects. Thirdly, the real problem with Pakistan’s power generation and distribution companies is a crisis of circular debt, which increasing production will not solve, but which the CPEC agreement announced in February 2016 will exacerbate. The government has approved the establishment of revolving funds, equal to 22% of monthly invoicing, “backed by sovereign guarantees to ensure uninterrupted payments to Chinese sponsors of CPEC energy projects”. If the purchaser fails to replenish the account, the ministry of finance will. Since distribution companies will default, because tariffs are low, and even those are not paid, the government will pay, up front, at least 22% of the bills of the Chinese companies. Other sponsors, and their Pakistani partners, hardly likely to run plants at a loss, will lobby for the same treatment, which the government cannot concede, because even the guarantee to the Chinese will be a huge drain on the budget. They will then let their plants go idle, which will return Pakistan to a power crisis, even if the CPEC plants run well, or approach the courts for injunctions against a government decision that patently discriminates between companies engaged in the same line of business. For all its brave talk, these realities seem to have now dawned upon the government, which, from some of its recent decisions, appears to be dragging its feet on CPEC projects, drawing criticism from two quarters, China and the Pakistan army. The planning ministry had asked for 350 billion in the 2016-17 budget for CPEC projects, which it oversees: it was given 124 billion, a third of what it needed. It has allocated 90% of this to road projects, not to the power plants, which might seem to reflect a shift of priorities towards the road sector (and raise suspicions in India), but this is just 15% of the 762 billion that the highway authority had asked for, so even this work is not really galloping on. The one project the government is pressing ahead with, brushing aside all opposition, including from two UN special rapporteurs, on cultural rights and on the right to housing, is the Lahore Metro, which is peripheral to the economic and strategic objectives of CPEC, but which the ruling party believes will swing voters towards it in the Punjab, which is its heartland. The project has run into heavy weather in the courts, and it remains to be seen if the government can continue with the demolitions of heritage sites and private buildings, and the forced displacements that follow, if the Lahore high court rules against it. If in its desperation it does, it might invite more serious trouble later, since the courts in Pakistan are no longer supine. And the army is lying in wait. Details of how CPEC will be funded, how much of it is a grant, how much of the investment is in the form of loans which Pakistan will have to repay, and on what terms, are mysteries, the entire agreement being opaque. What is transparent, even if extraordinary, is the army’s close interest in what is supposedly a purely economic project. To some, this simply reflects the army’s greed; since it has major commercial interests, promoted through its two foundations, it sees enormous new opportunities if the corridor throws up economic zones on its fringes, and plans to corner the lion’s share. That might well be true, but the army is playing a deeper and older game. After the attack on the school in Peshawar in December 2014, Pakistan adopted a national action plan (NAP) against terrorism, which gave the army a leading role, including the right to have terrorists tried in military courts. But shortly thereafter, the army announced the formation of apex committees in provinces wracked by terrorism, including Sindh. Formally chaired by the chief minister, these would include the local corps commander. These were not part of the NAP, but the government acquiesced in their formation, giving the army an institutional role in policing and law and order issues, which it did not have. There are reports that it is the corps commander whose writ runs in these committees. Immediately after the bomb blast in the Gulshan-e-Iqbal park in Lahore on Easter this year, the army demanded an apex committee in Punjab, which the Sharif brothers have resisted, since this is their bailiwick. If they cede Punjab to the army, they lose their political base. General Raheel Sharif has not given up there, but he has opened another front in CPEC to keep the government under pressure. China, for which the corridor is a flagship programme in its One Belt, One Road project, knew its workers would need protection in Balochistan and elsewhere. The Pakistan Army announced that it would raise a force specifically to protect them, but it has since played on Chinese fears that CPEC might stall. 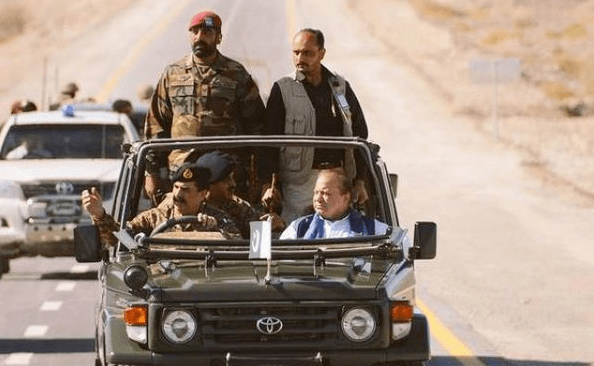 General Sharif has repeatedly and stridently played up its importance, the threats to it from India, and the army’s determination to see it through, projecting the army as the best ally China has on CPEC. From late last year, with the apex committees under its belt, the army has pressed for an institutional role in CPEC. In April, 2016, the minister for planning told a Pakistani newspaper that he had received an “informal proposal” six months back for the establishment of a CPEC Authority, in which the army would have a role, and for CPEC to be made part of the NAP against terrorism. The government did not accept these ideas, but General Sharif has not given up. In mid-May, he was in Beijing again, where he met Premier Li Keqiang, who, according to Xinhua, said that military-to-military relations had reinforced China-Pakistan ties, and economic cooperation and security collaboration between the two countries should be pushed forward “like two wheels”. Two wheels need an axle to move together: that is the Pakistani army. The ISPR account of the meeting was just as revealing. 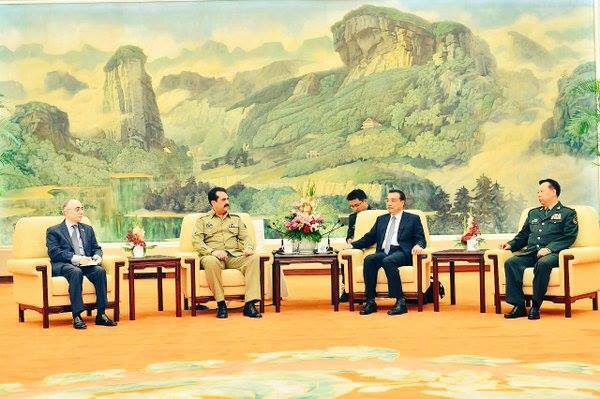 The Chinese leaders, it said, appreciated the army’s role in CPEC security, and the faster development of CPEC would “realise dream of prosperity across the region”. The subtext was clear: the Chinese believed CPEC was being held up, but trusted the Pakistan Army. Therefore, give the army a greater role and all would be well. As the civilian government tries to cling on to the remnants of its power against General Sharif’s determined attempts to whittle them down, wedging the army into institutional roles in internal security and economic development, it would appear that the Chinese, at least implicitly, are backing the army to get CPEC moving faster. All it will need is a substantial attack on Chinese workers on the corridor, which can be blamed on India, to force the government to cave in and agree to the army’s demand. If that attack coincides with some other crisis which would already have placed the government under pressure, a common enough predicament for Nawaz Sharif, the army will get what it wants, in the administration of CPEC and beyond. CPEC may or may not resolve one power crisis; it is likely to set off another. The game will change in Pakistan, but perhaps not in the way the government had expected. Agent_47 and Inactive like this. The real story of CPEC is the Army's control of an entire trade channel, from Gawadar Port to the Sost Dry Port (http://www.pakistanviews.org/index....n-from-chinese-and-leased-to-nlc-for-20-years ), with the added benefit of transferring the cost of a new security division by a direct levy on bills ( http://tribune.com.pk/story/1187386/ecc-meeting-power-consumers-pay-cpec-security/ ). That is why any criticism of the entire project is crushed by the fauji's boots, and cheerleading it is the order of the day. Nilgiri and Inactive like this. The difference is starkly clear, mind-numbingly callous, and endlessly sad. A scene that repeats all across the subcontinent. I hope it will one day be a distant memory. I opened the thread (more out of surprise that no one else had done so yet) over there. Follow the discussion if you would like. Your hopes may be noble, but sadly will be delayed indefinitely unless the basic issues are resolved first. To see if anythings changed. And invite any worthies to over here . LOL. I love your optimism, but nothing will change over there.